When we ask anybody the question "Who do you associate Veronica with? 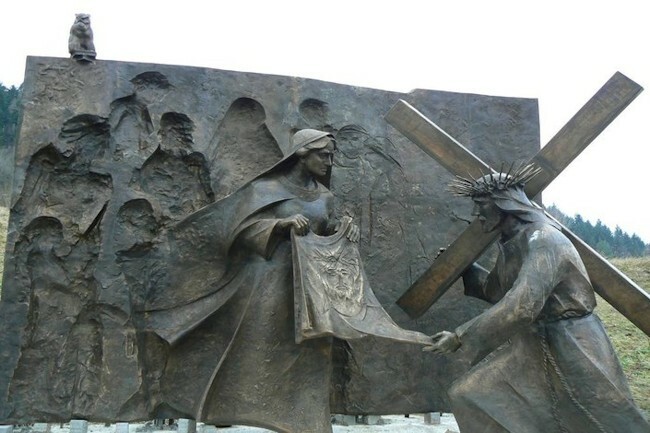 ", in most cases we will hear the answer "Veronica is the woman who wiped the bleeding face of Christ on His way to the site of crucifixion". 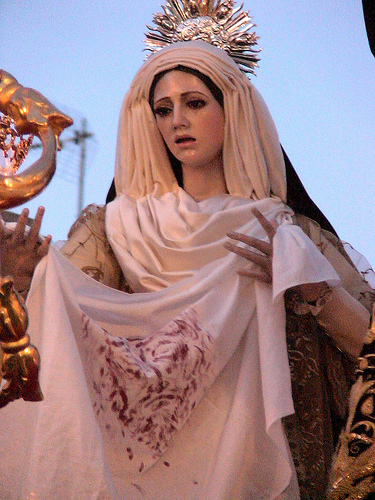 Since the 4th century christians have revered the character of St. Veronica as the embodiment of mercy towards the martyred Lord. A remarkable keepsake, the face of the condemned man imprinted on the veil, was to be the prize for Veronica. This motif has been eagerly presented in iconography over the centuries (see the gallery). 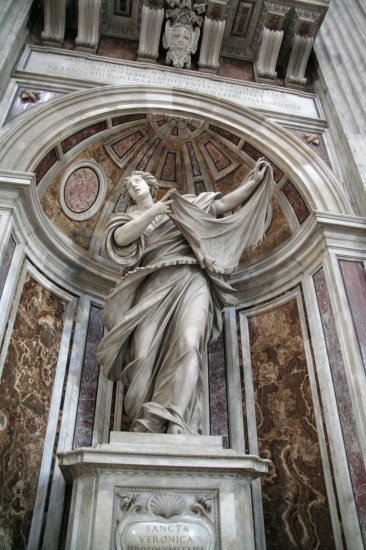 We can also find Veronica in countless paintings of the Stations in all churches of the world. We stop at the Sixth Station during the adoration of the Lord's Passion, especially during Lent. 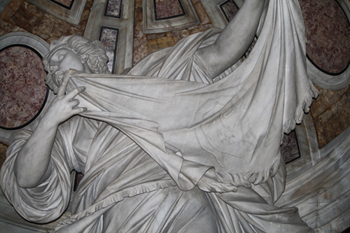 Veronica is also the term for the veil showing the face of Christ. Upon entering St. Peter's Basilica in Rome, we may admire one the four enormous pillars supporting the dome of the building, so called Veronica's Column. 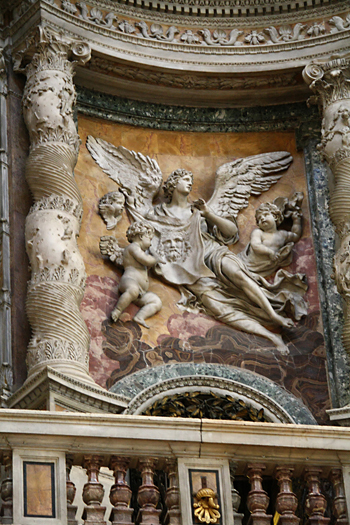 "In order to honour with dignity the majesty of the Saviour's Face, imprinted on the Veil of Veronica, Pope Urban VIII built and adorned this place in the Jubilee year of 1625"
On top of the column one might notice a beautiful relief with an angel lifting the veil with the image and the balcony from which an ancient worn painting, in which it is difficult to discern anything, is shown once a year. When we read the New Testament, we may notice that there is no mention of Veronica in any book. The Saint is a legendary character whose worship began in the 4th century and developed in the Middle Ages. Mentions of a matron from Jerusalem may be found in Apocryphal Scriptures, e.g. in "The History of Pilatus" from the 5th century. 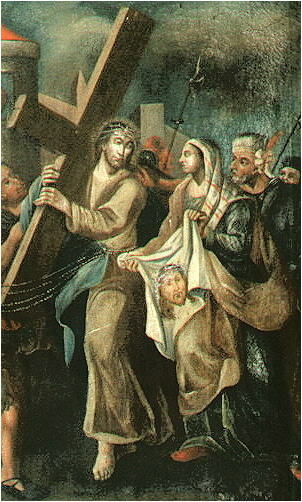 In the book Veronica is associated with the woman who touched the robe of the Rabbi and was cured of haemorrhage (Matthew 9:20). She was the one to defend Christ from Pilatus. Another apocryph associates Veronica with Martha of Bethany (Luke 10:38) or one of the women called Seraphina, mourning for Christ on His way to Golgotha (Luke 23:27). Later, she was to take on the name of Veronica and pass on the precious relic to Pope Clement I in 97 AD. 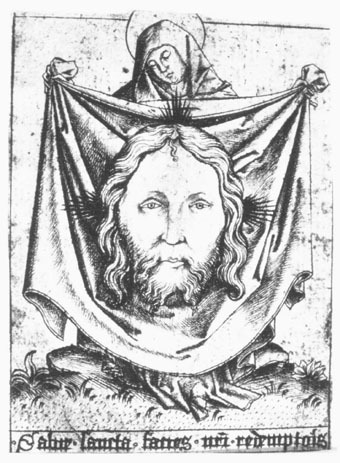 Therefore, one should not associate the word Veronica with a specific person but rather with the representation of Christ's face. 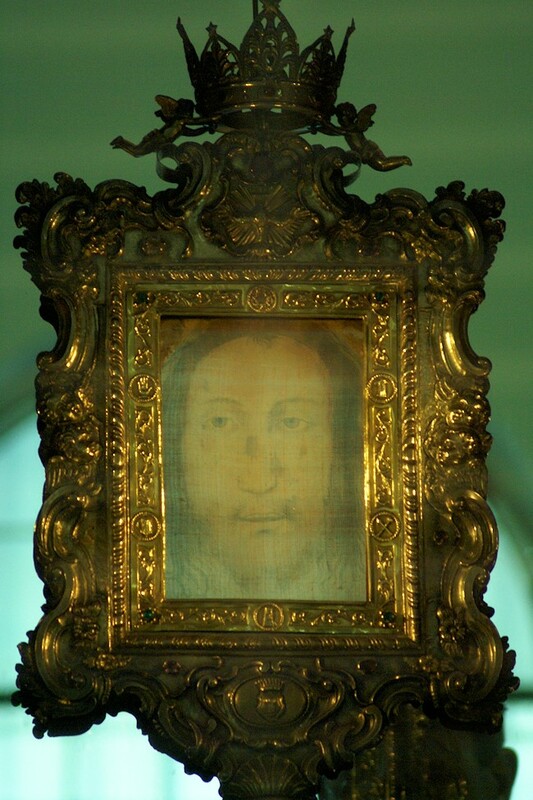 For five centuries the Italians living in Manoppello have called the image "Volto Santo", which stands for "Holy Face", and have specially venerated it. 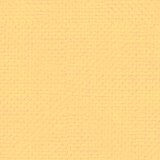 No traces of blood, sweat, or plasma have ever been found on it. The image was not created on the way to Golgotha but in a split second during the Resurrection.